By making two strong, divergent statements on Libya, Russia's ruling tandem has demonstrated its lack of coordination on foreign policy. The air campaign in Libya has had one unexpected consequence: It has resulted in the first striking and distinct manifestation of disagreement inside Russia’s ruling tandem. The clear difference in position between President Dmitry Medvedev and Prime Minister Vladimir Putin has revealed a fork in the road for Russia’s foreign policy. When questions of war and peace are being decided, powers that aspire to a global role should occupy a clear position—either for, or against. In the case of Libya, Russia abstained from voting on the U.N. Security Council resolution. Abstention contradicts Russia’s prior strict adherence to a single foreign policy principle: opposition of foreign interventions in internal affairs. Moscow has only once sanctioned military action against a sovereign state—20 years ago, when Iraq occupied Kuwait and action was aimed at punishing an aggressor. In Yugoslavia and Iraq (2003), Russia came out against such action, and at the height of the crisis in Zimbabwe in 2008, Russia infuriated the United States and the UK by using its veto to block a U.N. resolution imposing sanctions on Mugabe’s regime. Incidentally, at that time many people said that the Russian position was the result of disagreements between Putin and Medvedev. At a G8 meeting ahead of the U.N. vote, Russia’s brand-new president, Dmitry Medvedev, supported a petition criticizing Robert Mugabe. 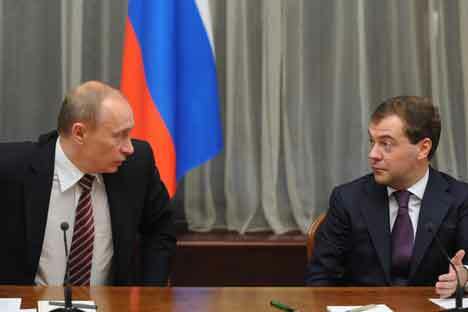 Commentators in the West supposed that later Putin must have overruled Medvedev, and the Kremlin’s position changed. But that is just speculation; in all likelihood, it does not correspond to the reality. At the G8 meeting, there was talk only of a political condemnation of Harare, whereas at the meeting of the U.N. Security Council, the United States and Great Britain immediately proposed harsh sanctions that had not been agreed on with Russia. Be that as it may, Russia did not have its own interests in Zimbabwe and its decision was based on principle. These days the Kremlin is remaining neutral, although the case of Libya is far more urgent. As for the real aim of the military campaign, there should be no illusions: The aim is a change of regime. Any scenario that leaves Muammar Gaddafi in power would be a moral and political defeat for the West and West-friendly regimes in the region. And given the example of Saddam Hussein, Gaddafi knows already what his fate will be if he is overthrown. Neither side can back down now. In the case of Libya, Russia voted pragmatically. There was no need to take a stand when the action was approved — regardless of motives — by leading countries in the Middle East. To Moscow, Gaddafi is just one of many partners and for Russia to risk a positive dynamic in relations with the U.S. and the EU for the sake of Tripoli makes no sense. Deliberations about lost contracts in Libya are a waste of breath: Given the situation there now, business as usual with Gaddafi would not have gone on anyway. The geopolitical purpose of Odyssey Dawn for the U.S. is to stop the erosion of its influence in the Middle East, while for Europe it is to prevent the definitive loss of its international role. If they put an end to Gaddafi quickly, they will have achieved their aim, at least for a while. But if the operation drags on and requires more than air strikes, which looks fairly probable, the effect may be just the reverse: Western influence may plummet in the region. Arab regimes that supported the action will also be in a vulnerable position. Their hope is to distract attention from internal problems, but as a result, they risk triggering a radicalization of the masses, which will accuse the powers-that-be of betraying the interests of Arab nations. All scenarios are on the table at this point, and there is the sense that the initiators of this war don’t have the least idea which scenario is most likely to play out. After the collapse of the Soviet Union, Moscow was at pains for a long time to confirm or at least imitate the status of a global power, participating in all decisions on the international stage. But towards the end of the last decade, Russia began to think of itself not as a likeness of the former Soviet Union, but as a major and influential, although regional, power whose vital interests have definite geographical contours. To defend its interests, Moscow is ready to use force, as it did in South Ossetia. All other actions are subject to negotiation or nonparticipation. Medvedev’s statements on Libya reflect this position. In contrast, the striking messages from Vladimir Putin show a global and universalist approach. The prime minister called the action against Libya “a medieval crusade” and American militarism a persistent tendency. Putin’s position insists on principles and the need to resist world hegemony. This means that the interests of Russia as a global power are not confined by regional frameworks, and that abstention is not an option when making decisions based on principle. Both approaches have the right to exist, but it would be advisable to pick one of them and stick to it. Simultaneously declaring both puts the country in a weak and ambivalent position, clearly demonstrating that the Russian leadership has no mutual understanding and no coordinated policy. This is especially dispiriting at a time when chaos is only increasing around the world.